Sagebrush Round-Up is in constant country motion in preparation for the West Virginia Country Music Hall of Fame Inductions this month! 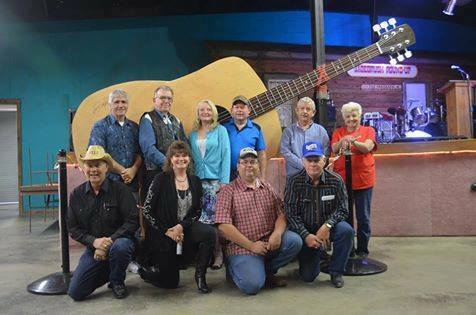 Sagebrush Round-Up is the host of a weekly country music show. Originally, Sagebrush Round-Up was a toe-tapping old time music radio show with upbeat western tunes intermixed with commercials and light-hearted banter. The show hit the right note as hillbilly music was gaining popularity in the late 1930s-early 1940s. The venue also houses the Country Music Hall of Fame for West Virginia. Here you can find musical instruments, pictures, history, information on former inductees and a 400+ lb. guitar. Inductions are held annually with previous inductees including Brad Crow, Donnie Leonard, Casey Reese, Bill Reny, Janice Lake, Lowell Robe, Shirley Snider, Noreen Snider, Noreen Arbogast and Lisa Janoske. Inductees are chosen by the Sagebrush Round-Up Board and voted on by Sagebrush Round-Up members. Musicians and behind-the-scenes country promoters are considered for their musical accomplishments and credentials. The evening isn’t just inductions, but – as you’d suppose – country music performances by a few of the talented inductees themselves. Hungry? Feeling peckish? Need a snack? A country cookie reception will be at 5 p.m. with country music – obviously. The ceremony will be at 6 p.m. And then?! It’s all country music all the country time. How many incredible artists can you and should you have in just one incredible country night? The Round-Up Band, Knighthawks, John Daugherty and Ronnie Vandergrift! As good country folk, Sagebrush always offers some good ol’ homecookin’. This week the kitchen will serve creamed chicken over biscuits and mashed potatoes for $8. Be sure to stop by the country store to take home some Appalachian memorabilia. The band was originally formed in 1969 as the Country & Western Swingers and was composed of only the Summers family. In 1980, it changed to The Knighthawks, bringing on many talented musicians. Today, Denny, Darris, Tom Koon, Bill Smith and Roger Gidley make up The Knighthawks. Hawker played in traveling country bands throughout his life, like The Royal Tones and Bob White & the Country Boys. He was both a singer and a rhythm guitarist. He won the Golden Circle Award for 50 years of musical service before he passed away in 2005. His love was hereditary as his daughter is lead vocalist in the Sagebrush Round-Up Band, ensuring that his legacy of love for country music continues. As regulars on radio station WWVA’s Worlds Original Jamboree from Wheeling, the brothers – Don, Ronnie, and Darrell – recorded for Hardrock Gunter’s ESSGEE label, the COZY label in 1959, KING and the Wheeling EMPEROR label. Lover of country music and organizer of country shows, Hutson is a former president of the Sagebrush Round-Up Foundation and currently organizes the West Virginia Country Music Hall of Fame at the Sagebrush Round-Up. He is a 20+ year member of the Country Music Association as well as a lifelong supporter of maintaining the country tradition. Dobbins worked in radio and television throughout central and north central West Virginia. At radio stations he performed as an on-air personality, news reporter, news director, commercial writer and program director. With some of these more country stations, he developed a reputation for his impressive interviews with country performers. Who? Well, Dolly Parton, Randy Travis, Jean Shephard and Keith Whitley – just to name a few. The late, great Nashville recording artists, Hawkshaw Hawkins and Little Jimmy Dickens, will be posthumously honored and inducted as well. (Harold) Hawkins was born in Huntington in 1921. After being discharged from the army, he became a regular on WWVA Jamboree from 1945 to 1954 in Wheeling. He eventually signed with King Records, and his songs Pan American, Dog House Boogie and Lonesome 7-7203 were top ten country songs. After performing a benefit concert with Patsy Cline and Cowboy Copas in 1963, all were killed in a plane crash. Little Jimmy Dickens (James Dickens) was born in Bolt, West Virginia and performed on radio station WJLS in Beckley in the 1930s before traveling the country to perform on radio stations as “Jimmy the Kid.” He was famous for his small size (4’11”) and introducing rhinestone-studded outfits into performances. He started as a member of the Grand Ole Opry in 1948 and was inducted into the Country Music Hall of Fame in 1983. So go for the country history, the country food and the country celebration, where you’ll have a good ol’ country time! Who is your all-time favorite country artist?